In the world of sales, everything is results driven and ultimately the only way to achieve results is through increased revenue. Therefore it is important for sales consultants and the likes to have tools to utilize that will help organize their efforts in the most efficient way possible. 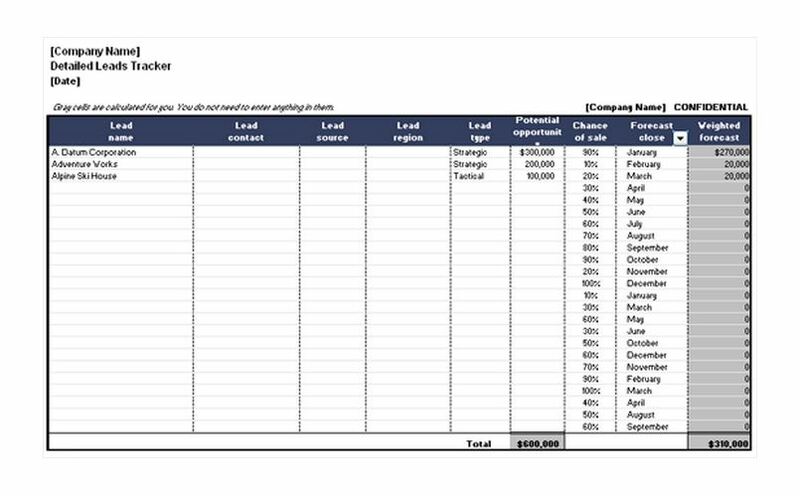 A Detailed Leads Tracker sheet provides an easy to process layout of customer information and allows sales consultants to make informed decisions about how to channel their efforts. With these new efforts you and your team can better attract new customers and forecast expected revenue. After all, without a constantly evolving customer base to sell to, increased sales cannot be achieved. Start by entering pertinent individual and company wide information into the appropriate areas. For your convenience they have been clearly marked on the template. Customize each header to individual specification to include any data you feel will help illustrate useful information to your sales force. Next fill out across each cell according to each header with available relevant customer information. Financial data is automatically calculated. Keep information concise to avoid disorganization. Pay close attention to ensure that date is being entered properly into the correct cells. Misplacement of information can completely ruin the benefits of utilizing such a worksheet. Ensure to keep backup copies of any stored Detailed Leads Tracker sheets in order to avoid a costly loss of information should something happen to the originals. Be sure that you and your team keep sensitive customer data protected less it fall into the wrong hands. Take a few minutes to help increase to effectiveness of your sales efforts. Download our free and easy to use Detailed Leads Tracker template today.